The Great Buddha of Kamakura is a monumental outdoor bronze statue of Amitabha Buddha located at the Kotoku-in Temple in Kamakura, Kanagawa Prefecture, Japan. The bronze statue probably dates from 1252, in the Kamakura period, according to temple records. 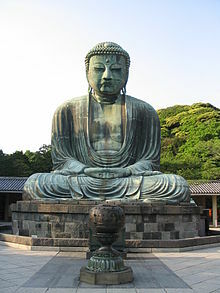 This article uses material from the Wikipedia article "The Great Buddha of Kamakura", which is released under the Creative Commons Attribution-Share-Alike 3.0 License.